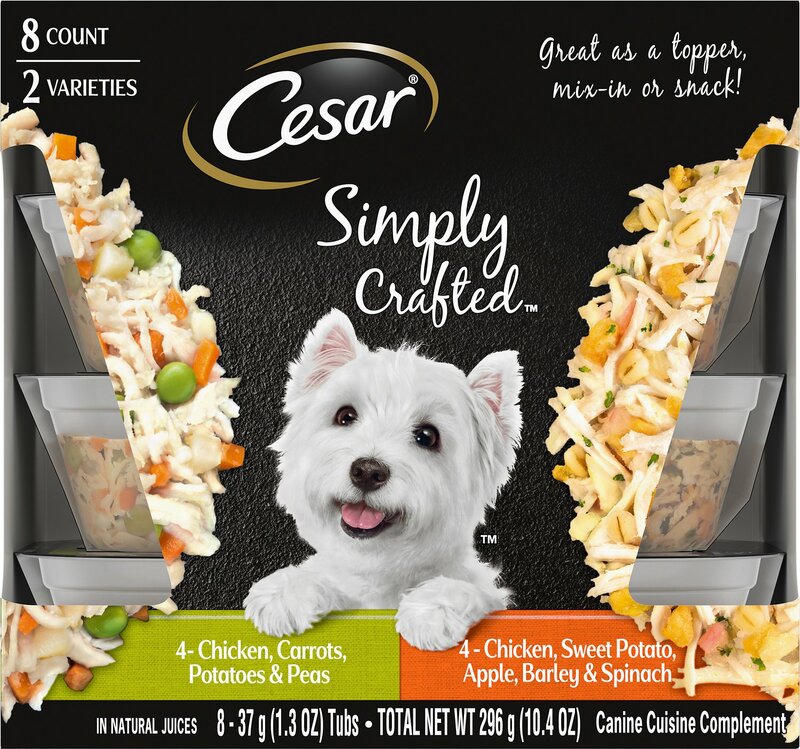 Add the delicious taste of real meat and veggies to your precious pup’s next meal with Cesar Simply Crafted Variety Pack Chicken, Carrots, Potatoes & Peas & Chicken, Sweet Potato, Apple, Barley & Spinach Limited-Ingredient Wet Dog Food Topper. 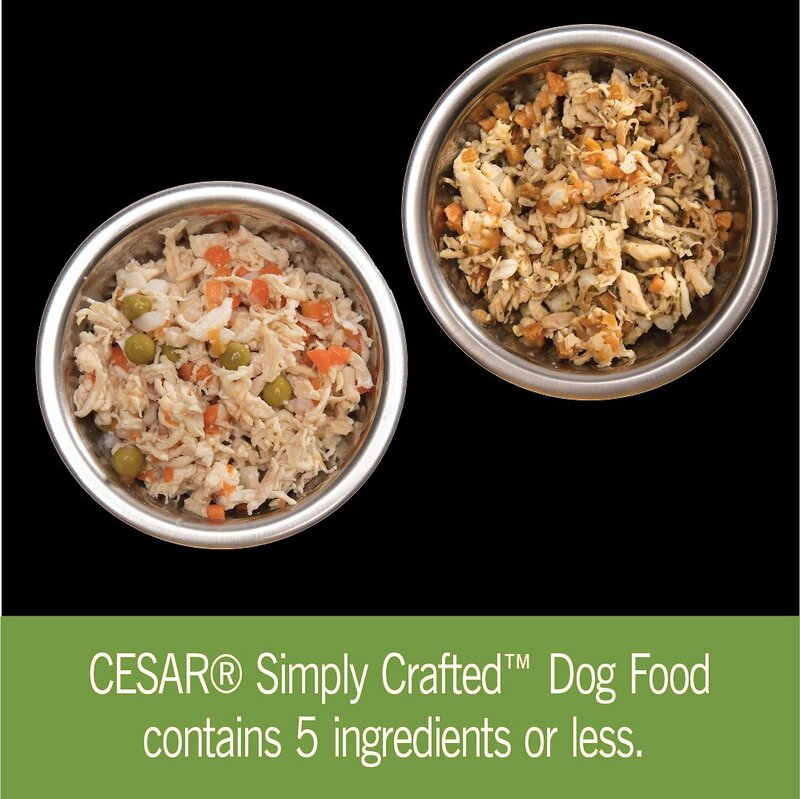 Featuring real chicken as the very first ingredient, these wholesome toppers will add paw-sitively irresistible variety to your dog’s dry kibble. Crafted with real foods and nothing else, they contain no artificial colors, flavors, fillers, or preservatives. And, they come in convenient tubs with no-fuss, peel-away freshness seals, so it’s easy to unlock more shared moments of joy between you and your furry friend. Contains no more than five ingredients–real chicken in natural juices, along with real fruit and veggies, for a delicious taste she’ll love. No-fuss, peel-away freshness seals are fast and easy to open; variety pack contains 4 tubs each of Chicken, Carrots, Potatoes & Peas and Chicken, Sweet Potato, Apple, Barley & Spinach. Chicken, Carrots, Potatoes & Peas: Chicken, Carrots, Potatoes, Peas. Chicken, Sweet Potato, Apples & Spinach: Chicken, Sweet Potatoes, Apples, Water, Barley, Spinach. All 3 love rice, so this was a no brainer for me to buy. Wish there were more pkgs, but I know to change my qty for next one. The short hair doxie hates the cold, so has put on some weight. He is not getting his long walks in!!! He is going to get a full pkg with a few kibbles to see if we can't get some weight off him for the next month. Thanks for such excellent service & delivery and having versatile products for us to choose from. I had to put this on auto ship because my dog can't get enough of it! I'm afraid she'll be giving me the old "stink eye" if I run out. She gets it in the morning after our first walk of the day. My Cats and Dog love this! This was very good and fresh smelling even to me and my cats had to have some. I was surprised to see that the containers were only half full. Rather expensive... you are only getting 1 ounce. But my dog and cat loved it. My toy poodle who’s 15 loved this dish. I’ve never bought it before I usually buy the regular Caesar meals. As a new user customer on Chewy I’m sold. She loves it and i now use it as a treat since one tray is not enough for a complete meal for her. i have a 3 pound chihuahua and this food is awesome for her. just the right size for a meal and not a lot of ingredients in it.she loves this stuff. 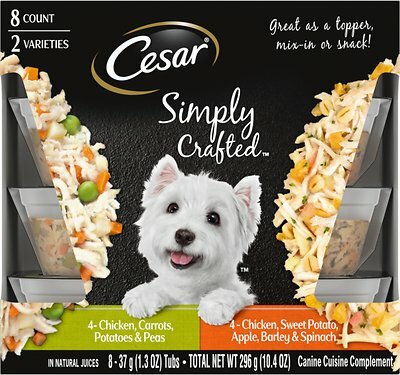 All I can say is that my dog is very fussy and she loves the "Home" brand of Cesar food. I stopped feeding my dog, dog food and made her food from human food at home. The dog food is as close as I am going to get and again she loves it. Perfect, as usual! Always on time, always just what I ordered, never any mistakes! Love the folks in the service department.